If the thought of loading your bike with camping gear and heading out for the weekend into the wild blue yonder seems like a faraway dream, we’re here to help. You don’t actually need fancy gear or a special bike. Even if you’ve never toured before it’s easy to convert the bicycle you’re riding now for overnight touring the many beautiful country roads surrounding Portland. The good news is that you don’t have to run out and buy a special bike to do a multi-day, self-supported tour. Chances are the bike you’ve got will work just fine. Check out some tips and resources below and you’ll be ready for the open road. Mountain bikes make great tourers. Mountain bikes and hybrids work well because they’ve got plenty of room for racks and fenders and you’ll have very low gearing. Having a three chain rings (the gears in the front) will give you one very easy option for getting up hills. Older mountain bikes without front or rear suspension work best for pedaling efficiency and rack mounting. Remember to swap out knobbies for slicks before you hit the road. Even an old road bike can work. Depending on how fancy it is, you can attach a trailer to most any road bike and a few can even take racks. Most road bikes have higher (harder to pedal) gearing which make it more challenging to travel. Consider finding a bike with three chain rings if your route includes any significant hills. Longtail cargo bikes like Xtracycles have become ubiquitous around Portland; but they also make perfect touring machines. The long wheelbase provides stability and the side bags give you lots of room to store your bedroll, food, and other touring essentials. For family touring, longtails might be the perfect option. 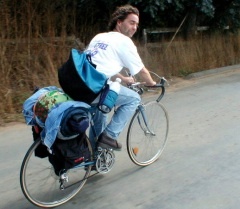 Rear racks are usually the preferred method by beginning travelers because of convenience and stability. However, carrying weight over your rear wheel can increase flats and spoke breakage. Some folks spread the weight out by using a front rack as well. Racks can be attached in two ways. Your bike may come with eyelets that bolts can easily thread into, or you can use rubber coated hose clamps which are easily found at hardware stores to fashion one on. If you use this method, make sure the clamps are very secure. power of a milk crate. You can install racks on most bikes and don’t necessarily need to spend money on panniers (the bags that attach to the sides) if you strap a milk crate or soft backpacking pack on top. The weight carried high can be unstable, so pack carefully! 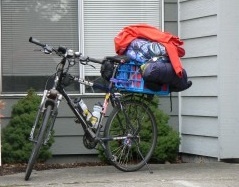 Panniers advantage is being able to carry your load much lower, which increases stability. Consider borrowing some or purchasing an inexpensive set, or making some out of waterproof buckets. Trailers are a good option for people with bikes that don’t easily take racks by attaching to the frame or through the center of the rear axle. They keep the weight off your rear wheel and have less wind resistance, but can decrease stability at high speeds, add the weight of the trailer to your load and increase overall drag. Your bike needs to be in tip-top shape. 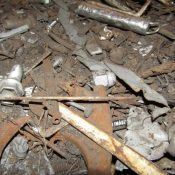 A trip being cut short by mechanical troubles is never fun — and it may take a while for that ride back. Make sure your saddle is tested over long hours. Sporty bike shorts with padding (chamois) help ease soreness, but for trips without them try to wear breathable fabrics that wick moisture away. Chamois cream or lotion to ease chafing might also be something to consider. Consider the number of gears you’ll need. You may have noticed much of the Pacific Northwest is mountainous, and you’ll be adding 25-50lbs of weight to your ride. Your gearing choice can make the difference between riding and pushing your bike up those hills and can protect you from injury. Hey, it rains here! They can make a wet day much more bearable. A wider tire (over 1-inch or 28c) can make for a smoother, more stable ride. Investing in a Kevlar tread is your first defense against flats — but before you head out, make sure you know how to change a tube! You must drink and there may not be places to stop. Install 2-3 water bottle cages, or carry a bladder on your back or bike. Handlebar bags make it easy to get to snacks and maps. They range from fancy to hand-made — I found my last one in a used bike shop for a dollar! When you’re on the road, oil your chain and air up the tires daily. This gives you a chance to look the bike over and make sure all looks sound and keeps your ride smooth. In the end, just remember to not let your lack of a “real” touring bike keep you from enjoying the thrill and satisfaction of self-supported touring. For a bit more inspiration, check out a great upcoming event on August 2nd, DIY Cycling Adventures with Michael Sylvester. Now that your bike is ready, here are some resources on what to bring and where to go. — Cycle Wild: A Portland non-profit with a mission to reconnect people to nature via the bicycle. They organize group trips in the Portland “rideshed” as well as touring education and support. 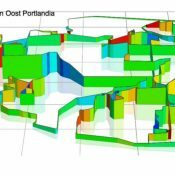 — PBOT Regional Maps: The City has some great maps available for overnight options from Portland. — Cycling Sojourner: This inspiring blog details Portland author Ellee Thalheimer’s bike touring adventures — including rides around Portland that make great beginner tours and inspiration to see more of our great state on two wheels. 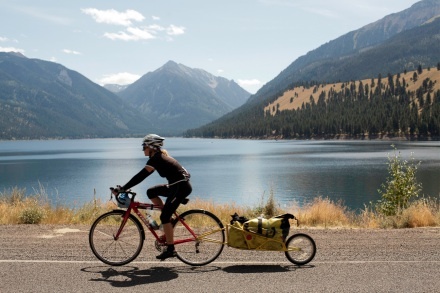 — Bicycle Touring 101: A website that offers touring options, advice and opinions. Another great resource for what to bring and creative ways to convert your bike. 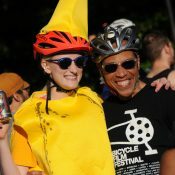 — Cycle Oregon: This non-profit offers superlative supported group rides, but check out the past routes (with maps!) for great destinations throughout the state. — Tori Bortman is the owner of Portland-based Gracie’s Wrench, a business that offers individual and group bike repair classes tailored to your needs. Want more tips? Check out Tori’s past columns in the archives. Don’t forget to put stuff on the front (rack). Your great photos curiously show all the weight on the rear rack, which is far from optimal. Great article. Thanks! I’m planning on riding from Portland to Pendleton later this summer. Where can I get info on how to connect to all those side roads and paths east of Multnomah Falls so I don’t have to ride on I-84 so much? Think about SR14 and crossing at Umatilla. I’ve ridden it a number of times. There are a few tunnels, but they are not too bad. A friend and I are headed out on our first S24O on Friday, so looking forward to it. Perfect timing on publishing the article. 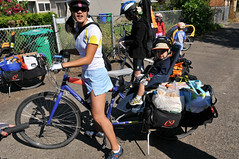 I am going to try out the Burley Travoy trailer that I have instead of putting racks on my bike. Might add racks eventually but at least for this short trip the trailer should work fine. Nice work and thanks for the Cycle Wild shout-out, Tori! I’m pretty sure the mountain bike with the blue crate is Matt Picio’s. But I’m a little bothered by the lack of photo credits. Are all the photos of your own? Hey Tomas, I am responsible for the photos and captions. Tori supplied them so I assumed they were hers. Please email me if you know otherwise. Thanks Jonathan, I’ve recently been let down about promised photo credits so now I’m on the lookout and try to be diligent in my own blogging when using other’s photos. There was a mis-communication with Jonathan that some of those photo credits were to go to Cycle Wild. There were no photo credits on that site to give direct credit, but I was hoping to at least credit the site (unless you know who the credits belong to). I’ll let him know which ones and get that straightened out. 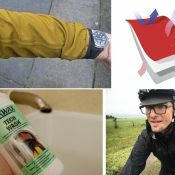 Another resource for beginners (or experienced bicycle tourists), is the Adventure Cycling Association’s ‘How To ..’ section on their website. YES!!! Adventure Cycling is an excellent resource, including bicycle maps for many routes, forums, a great magazine. Me and my boyfriend are currently on a cross-continent tour ourselves, and I encourage anyone to try touring who is interested! My favorite spot for first-timers is Stub Stewart! Take the MAX to the end of the westside line to start, and then it’s eleven miles through rolling low-traffic farmland, a stop in Banks, and then eleven miles on a rail-trail. It doesn’t get better than that. And if you get a cabin in the park, you don’t have to carry much camping gear. I’ve gone over 50 mph with with my Nomad, very stable. I did upgrade my tires to ones that can take 85 psi though. I have gone over 50 mph with my BOB and it was a bad idea…. I’ve gone thousands of miles with my BOB, including some +50 mph downhills, and never had an issue with stability. Why was yours a bad idea? +1 for the handlebar bag. It is unbelievably convenient to have your essentials (sunscreen, map, wallet) in easy reach. The less times you dig into your bags the better! The states of Oregon and Washington have state bicycle maps for free. Check local bike shops, Oregon and Washington Dept of Trans offices or state government websites to find them. You can bring along the “highway maintenance hotline” phone numbers and emails for all the states you plan to travel through. Even though the roads won’t be improved for some time, your requests may make for a better riding experience for next year’s riders. Otherwise, just take pictures of poorly maintained roads, or just call them in and tell them they need work. It’s a bushtrekka fold out tent on top of a trailer. I wouldn’t really buy it since it has horrible quality control issues per reviews on amazon. Thanks for the link to the Gorge map! I’ve seen a couple comments on trailers, so I’ll throw in a few things. I have a Burley Solo that I bought for utility use. I removed the seat and created a “suspension floor” using climbing rope. I then placed a thin sheet of wood on top. It’s flat and distributes the load over the entire frame. I also put Maxxis Hookworm BMX (freestyle) tires on it. They have a super thick tread to reduce flats and can be run at high pressure. The conversion has allowed me to carry some pretty bulky items (like a whole extra bike and all my recycling, but not together!). I’ve also got a set of Vaude panniers that I have used on my commuter bike for ten years now…highly recommended…with good heel clearance to boot. ODOT publishes a bike touring map of the coast and its a great tour. The shoulder is wider on the north to south bound side and that’s the way the prevailing winds are headed. The map has suggestions for detours off 101 where the shoulders are crappy, or the sight seeing is better elsewhere. link to map pdf download. Hey is that you I just saw coming through Salem? If so, you guys were riding one of the nastiest possible routes – only a few blocks parallel to the sweet Willamette Valley Scenic Bike Trail. As a longtime BOB-trailer tourer, I’ve got to defend the one-wheel trailer. Personally, I don’t find load-balancing to be an issue at speed. And while you do have to find something to lean the bike+trailer against to park it, I’ve never found that to be a big problem. The problem with two-wheel trailers is that instead of one wheel path down the road, you’re now rolling on three parallel lines. 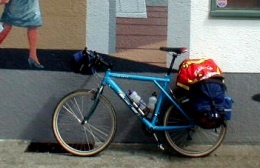 I’ve heard lots of stories of two-wheel trailers causing problems for touring on roads with narrow shoulders: optimal positioning of the bike results in one of the trailer’s wheels rolling on gravel, or in the brutal rumble-strip separating the shoulder from the travel lane, or off the road completely. Two trailer wheels also means twice the added rolling resistance as one trailer wheel. 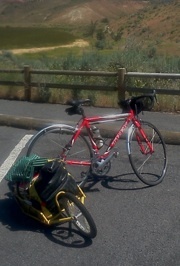 I’ve also done a fair amount of touring with panniers. To me the rule of thumb is this: if I can fit my gear into two rear panniers , I will do so, thus avoiding the extra weight, complexity and rolling resistance of the trailer. This works well for single overnights in warm weather, or where services are readily available and I don’t have to carry too much food and water. If rear panniers alone won’t fit everything, then I’ll usually go with the trailer. The extra warm clothes and bedding needed for cool/cold weather camping, or the extra water and survival supplies needed for safe desert touring, generally push me into using the trailer. One more big thumbs-up for handlebar bags, especially those with map windows. In addition to handlebar bags, I like to tour with two Mountain Feed Bags (http://www.revelatedesigns.com/index.cfm?fuseaction=store.catalog&CategoryID=2&ProductID=12). Between these and a handlebar bag you can have a lot of your stuff easily accessible. +1 to the BOB. One of the benefits is that packing becomes much simpler with a single compartment. In off road situations, a two wheeled trailer tips over constantly. Personally, I’m a fan of front-and-rear panniers. But the pannier vs. trailer debate will probably rage on forever.